Following a recent comment from one of my readers about the difficulties of wearing hijab when you're curvier I decided to make a post about it. I've been revising (reading my old fashion mags..) plus size fashion and have been trying to put together some tips and tricks to make covering those womanly curves slightly less stressful. 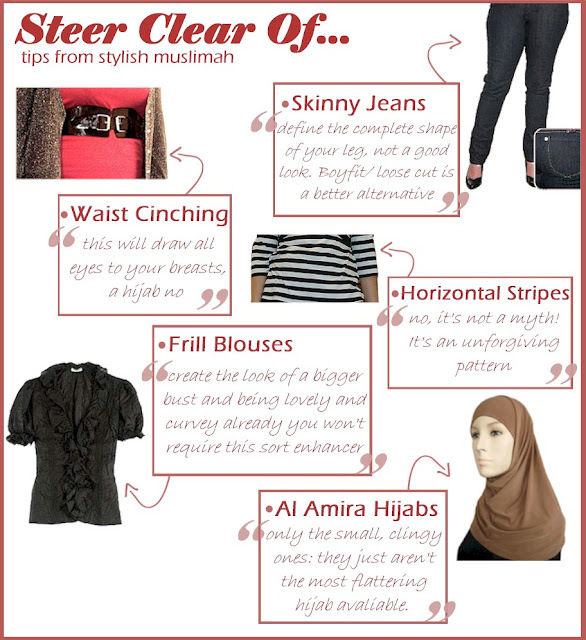 I hope you find it useful :D Starting with the negative as always..sorry the writing's small, it looked bigger when I was making it..
i think if girls (no matter whaqt size) stick to loose clothing then they shouldnt have a stressful time hijabifying. i love the last outfit btw! Great, great, great post! I'm not plus sized by far but stick to some of these tips, like the horizontal stripes one, anyways. Again, I really love the new style of the photos. They look like they belong in a magazine! Really cool, masAllah. Keep it up! Your post is so well-done and thought-out! As always, your work is just wonderful. I know this blog article is older but I had to say something. I'm actually Christian but in my desire to dress modestly as an exercise of my own faith, I have been looking for options. The few Christian sites that specialize in modest apparel seem to associate modesty with one's ability to repel, the overall message being the more hideous and outdated the better. There really aren't any Christian modesty style blogs unfortunately. I love what I am finding on the sites devoted to hijab. 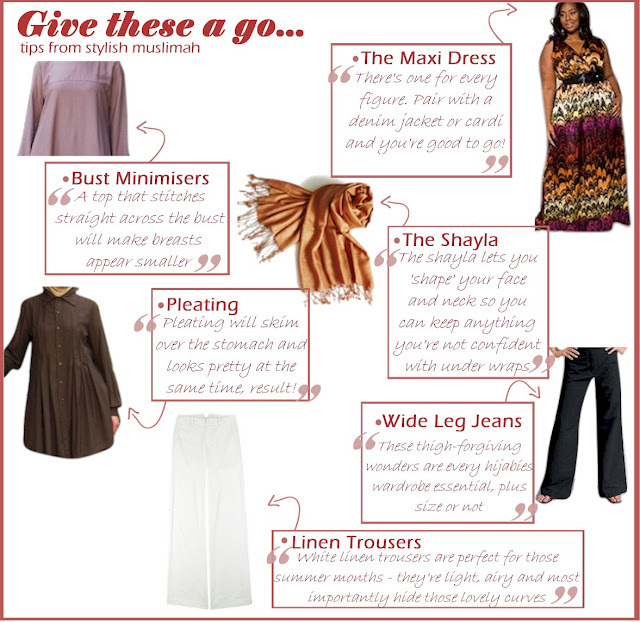 Somehow Muslim women have found a way to reconcile modest clothing with beauty and style--how wonderful. Thank you for this article.